We relocated a few months ago and amongst the huge list of services and contracts to transfer to a new address is, of course, your TV, Phone and Internet provider. Unfortunately transferring to a new address with Virgin Media wasn’t all they promised. “99.9% related to new network ID not matching the settings in the TiVO. *If* you can access an engineers menu to swap ID should be OK”. So as the below article suggests, you are in the hands of the gods, needing both a willing engineer and customer service contact during installation. In the UK there’s essentially three providers of the all-in-one telecoms package – BT, Sky and Virgin Media. Moving house gave us the chance to reevaluate our current deal, but while BT and Sky’s offerings were tempting, we’d decided to stay with Virgin Media. Its broadband is unrivalled, and, most importantly, we had a TiVo box already customised to our favourite shows and full of recordings we wanted to keep. Unfortunately on installation day, things weren’t as smooth. We handed the engineer our carefully packed old TiVo, to which he instantly replied “that won’t work down here”. Naturally we were confused – that contradicted everything we’d been told by Virgin Media so far. The only solution, he said, was to format the TiVo box and start as new. We immediately stopped that installation in order to do some more research, hoping it was just a lazy third-party engineer. Unfortunately he turned out to be completely correct. Despite neither the UK Call Centre staff or the online Community having any knowledge of the issue, it’s common amongst the handful of engineers and installers that we spoke that to – TiVo boxes are (in some cases) region-specific, and you can’t simply expect a Virgin Media TiVo box to work in another location. The reason is simple: The problem lies with the technology – Virgin Media’s network is merely an amalgamation of smaller cable companies which NTL (Virgin Media’s previous incarnation) acquired. As such, each area works off a different node, and the technology and protocols between each may vary slightly as to how the equipment interacts. Move house to within the same area (here’s a rough guide, but by no means definitive as to what works where). Backup your recordings to DVD. Take your old TiVo with you and hope for the best. The main issue is that once your old house is disconnected, there’s no way of powering up your TiVo again, meaning any backup must be done before moving. Each TiVo has a unique serial and card combination, every time it boots it contacts the Virgin Media servers to check it’s a legitimate connection. While there are a couple of accounts of people successfully moving a TiVo to a new region, you are completely at the mercy of your local installer to whether they will be willing to help with the issue. The third-party engineers are very dismissive of the Call Centre staff’s knowledge, and trying to navigate Virgin Media’s switchboard menu is virtually impossible for a bespoke case, usually resulting in a conversation with an an offshore assistant who merely has a set script by which to advise you. As with many huge corporate companies, it seems that the staff don’t have one clear directive for this problem. As such, there is little you can do. Certainly if things go wrong you can complain (choose ‘thinking of leaving Virgin Media’ on the switchboard) – we received £50 compensation and a discount on our service for two months, but little recompense for the hassle it caused. To save your recordings, the only option with TiVo is to output them to DVD. For this you need a DVD recorder, and a SCART cable, and literally record the output feed in real-time from your TiVo. It’s not really a practical option, especially given the lack of HD output and manual nature of the task, but will suit if there’s anything particularly precious you can’t bear to lose. While you can then transfer these recordings from DVD to a PC or Mac, you can’t transfer them back onto your new TiVo box. As for all your TiVo favourites, series-links, apps and other personalised features, unfortunately they will all be lost if you are forced to use a new TiVo box, or wipe your old one. Most annoyingly, a new box won’t know what you’ve already watched either, so will record all episodes of a series if you select ‘New and Reruns’ in the options. 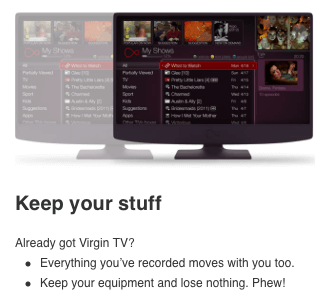 There did used to be a TiVo Box Swap service, but it seems with Virgin Media shutting down most of its online cloud-based peripheral features, that too has gone. There remains a support article on How to copy TiVo settings, but again the steps listed don’t match up to the menu options available once you log in. The only positive side is you will get a shiny new TiVo box (and possibly soon a 4K TiVo), that will undoubtedly be faster than your old one. As for your old box, it is worth taking it with you when you move, but be prepared for the worst. As a result, you should be able to use this to negotiate heavily with Virgin Media, and get deals on the same terms as a new customer, if not better. It’s far from perfect, but may make the best out of a bad situation.